Does your interaction with your daily devotion look something like this? Be amazed at the awesomeness. Think to yourself, wow, that is good! Then go about your day and gradually forget about what you read. Well, we all know the importance of spending quality time with God each day. Whether it be a daily devotion, listening to a sermon, or reading the Bible, we all need to do something every day to feed our spirits. God’s Word is our source. Our relationship to the Word similar to an electric device that is plugged into the wall. If you unplug the device from the wall, it loses power. If we unplug from the Word, we lose power. In John 6:63, Jesus says, “The words I have spoken to you, they are full of the Spirit and of life. The Word of God is life! I don’t know about you, but I want to make sure that I’m “plugged in” to the Word of God – daily. Reading a daily devotion is a great way to get yourself into the Word of God. It gives you a little spiritual “snack”, if you will. But just like we need more than an occasional snack for our physical bodies to survive, the same is true for the spiritual side of us. Do more than just snack on the Word of God. Yes, read your devotional. But don’t stop there, take it to the next level. Go deeper with your understanding. Don’t stay at a surface level. So here are some tips to help enhance your day to day routine of reading your devotion. Hopefully, these tips help you to take it to the next level. As teachers, we know that writing is another modality we can use to solidify concepts for our students. 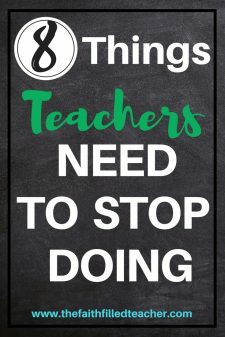 When we have students write about a topic it gives them another exposure to the content and provides an additional opportunity for the content to “stick”. We can use this same process with scripture. 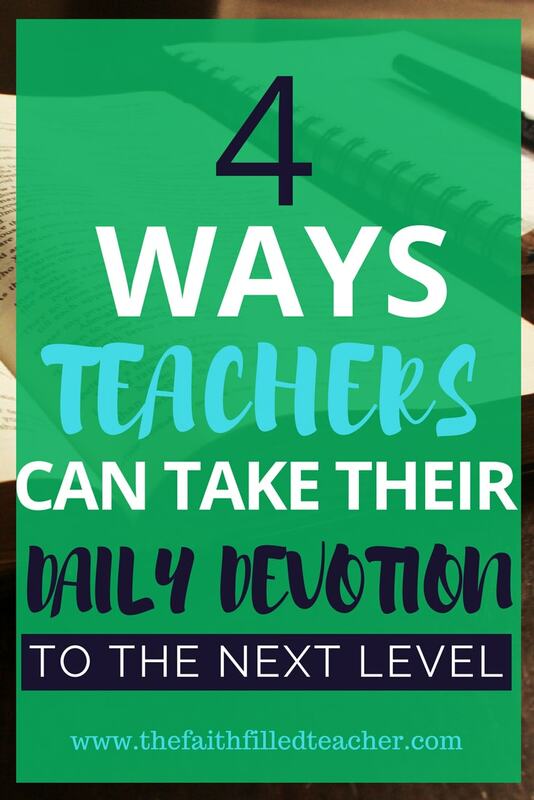 Take your daily devotion to the next level by taking the focus scripture(s) and writing them down. You can write your scriptures on sticky notes or in a prayer journal, or both. I personally love using sticky notes because you can put them anywhere: a bathroom mirror, refrigerator, in your car or by your desk at work. Writing down the focus scripture helps you to familiarize yourself with the Bible. I believe it’s important to have the Word in your heart. It’s important to be able to pull those scriptures from your memory when you need them in a certain situation. Writing down scripture helps you to do that. Once you write them down, place the scripture in a place that you frequent often. When you see the scripture, pause and read it. After you read it, take some time to think about the meaning of the scripture. Meditate on it. You can also take your daily devotion to the next level by taking the aspect of writing scripture a step further. You can do a reflection on your daily devotion. 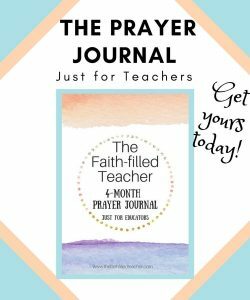 You can use a devotional journal, a cute, decorative notebook, or a prayer journal to keep written reflections of your daily devotion. 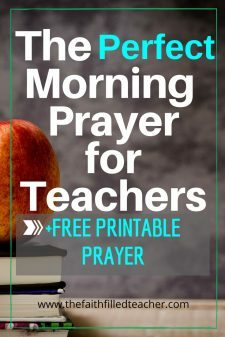 The Faith-filled Teacher Prayer Journal includes pages designed for devotional reflections just like what I describe here. You can preview the journal HERE. A written reflection can help you solidify the ideas that you read about. The other thing I love about written reflections is that you can turn to them and read them at any time. It’s impossible to keep all of your ideas and revelations in your head. You need to be writing them down so you can come back to them and refresh your mind with them. This is a simple concept, but one that I believe is very powerful. Make it a point to revisit your devotion before you head to bed. You know those few minutes where you lie in bed scrolling through Instagram or watching your favorite Youtube channel? Why not use some of those last few moments before bed to reread your devotional. It’s a great way to remind yourself of the promises found in it. The Word of God tells us to meditate (think about, ponder) on the Word day and night (Psalm 1). One of the benefits of meditating on the Word is that you’ll be like a tree planted by the rivers of water. This tree spoken of in scripture produced fruit at the proper time and had leaves that didn’t dry up. Being like this tree means that you’ll have success in every area of life. You’ll produce fruit in your life at just the right time. God also told Joshua (1:8) to meditate on the Word day and night. 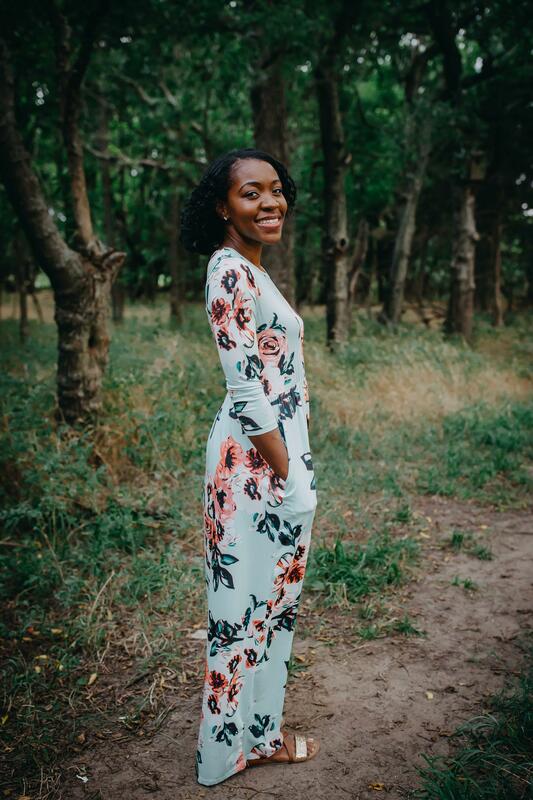 God told Joshua that prosperity and success would occur as a result of meditating on the Word. So revisiting your devotional is a way that you can build in some extra time meditating on the Word. And it might also help you get a good night’s rest too. It’s imperative that we not only READ God’s Word and materials like devotionals, but we must STUDY them. Our spiritual growth depends on it. We should never find ourselves only being spiritually fed from someone else’s revelations of God’s Word. We should get into the Word so we can gain our OWN revelation of the Word of God. We need to know God’s voice. God wants to spend time with you. Similar to how I talked about spoon feeding students in this article, we should also steer away from being spoon feed Christians. Take your daily devotion to the next level by studying the scriptures in your devotion. I highly recommend you open your Bible and read the scriptures in context. Pull out your concordance and look up the meanings of words. Pray and ask for understanding of things that you’re unclear about. Don’t just read the Word, study it. So make it a point to find some ways to take your daily devotion to the next level. Remember, any time you spend in the Word is time well-spent. Go deeper with the Word and move beyond the surface level. When it comes to the Word, focus on quality, not quantity.